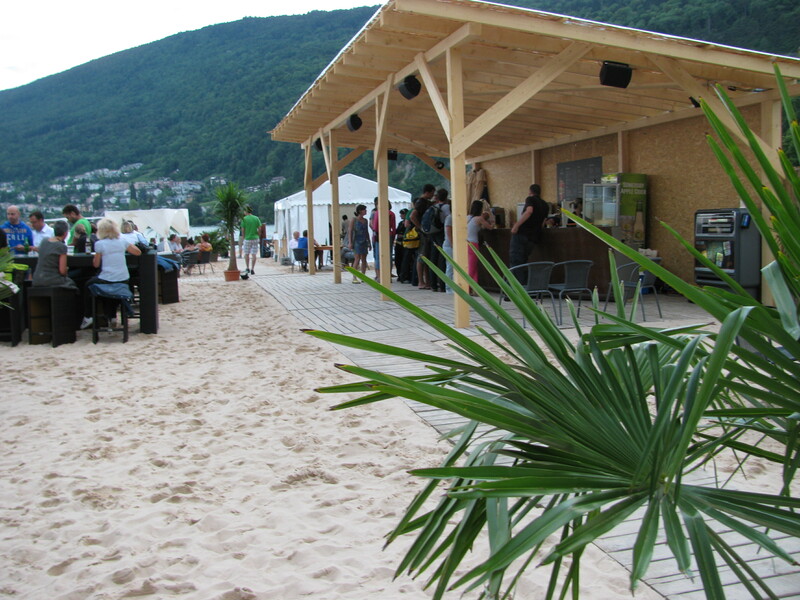 Biel/Bienne beach gets a summer face-lift. We took a 15-minute stroll down to the lake last night and discovered it had gone tropical. 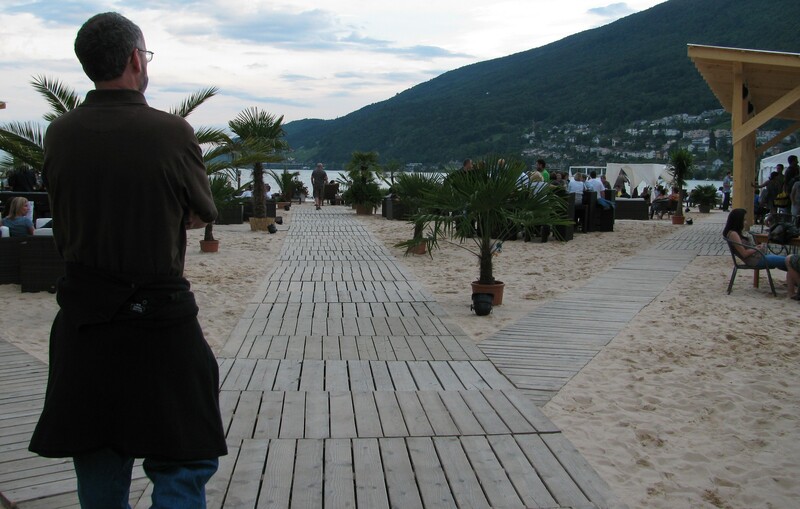 Ordinarily, the waterfront looks similar to North American urban shores with wide green stretches of parkland, towering leafy trees, shrubs hugging wood benches and paved promenades. 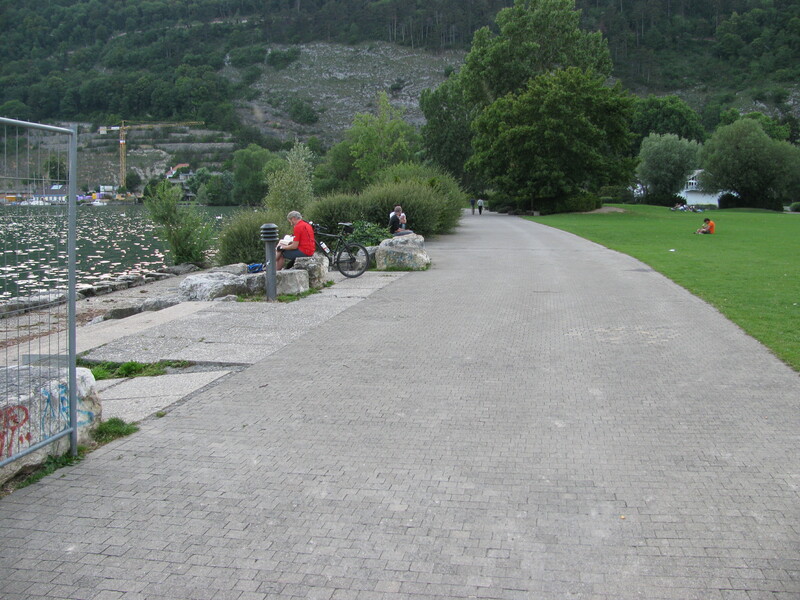 BEFORE: How the park usually looks - asphalt, lawn, shrubs, rock-line shore. Last night, we found a corner had been barricaded behind unpainted plywood walls, its pebble and asphalt ground topped with 132 cubic tonnes of fine quartz sand four-inches deep. The park benches had disappeared, to be replaced with potted tropical trees and rambling open-air wood cabanas serving up food and drink. Wood boardwalks already made gritty with foot traffic led past a discreetly tucked-away public washroom trailer. 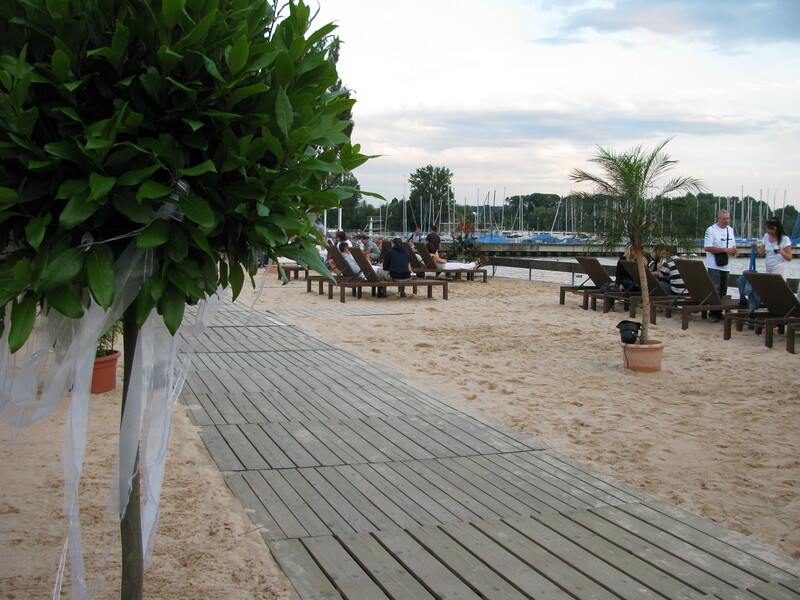 The sandy spans between the boardwalks were furnished in wickery loungers, tables and chairs, as well as what can only be described as beds. It was all lovely. AFTER: Palm trees, sand, lots of people. I am not enthusiastic about alcohol-service in a park, however, the clientele looked dignified and sober, but that was at 9 p.m. I cannot say what it looked like at a later hour. For those Victorians reading this, imagine the screaming that such an undertaking would create back home in Victoria where a good stretch of the urban waterfront is paved parking lot, and should an ice cream kiosk dare to brave the virgin cliffs along Dallas Road, it would be met with the city’s version of a lynch mob, that is, a preservation society that would quickly douse the vendors in letters-to-the-editor and petitions. While we’re on the topic: Victoria and its neighbouring communities are home to almost 100-km of trails that run through rainforest, oceanside and farmland vistas, and yet only two public washrooms can be found along the trail. It’s as though the whole population gets by without bladders. Meanwhile, the Swiss look at a beautiful lake, and think “wouldn’t sand be nice right here, along with some place to get a snack,” and then they do it. No protest, just plenty of Swiss out along with two Canadians, enjoying the lake air on a hot summer evening. 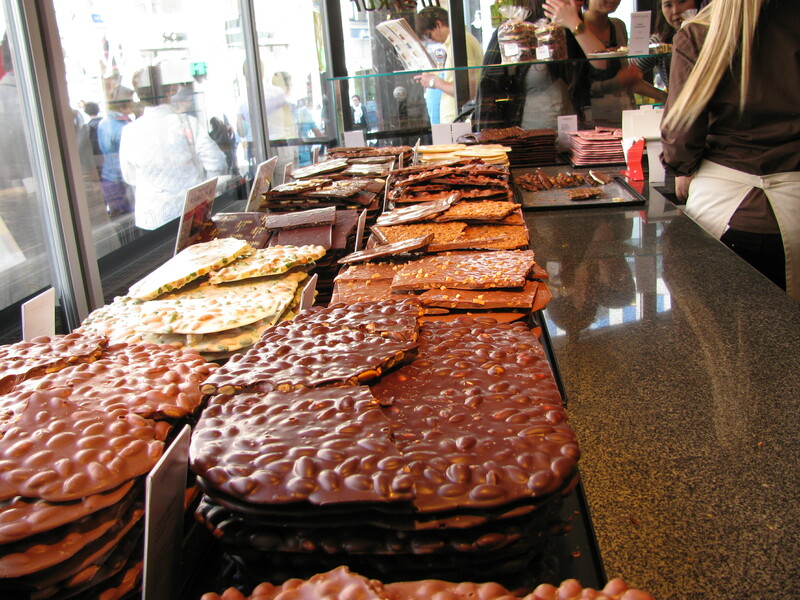 Addendum: I have since learned that the city of Biel/Bienne funds this seasonal oasis. It is set up every year and taken down in the fall. The city usually removes the sand, but sometimes spread it out over the pebble base, instead of trucking it away. 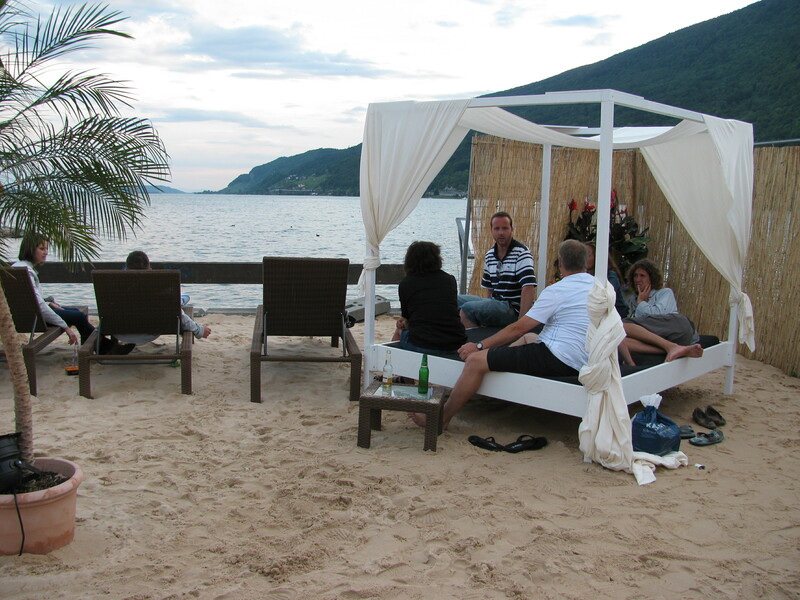 Large cabanas with long ship-hull-inspired bars serve food and drink. Dave wanders into the park and wonders, where the heck did all this sand come from? And the beach furniture? And the hot dog stand? ……………. and cool here again! I love the idea of snack and ice cream places in parks. It seems Victoria is behind times or reluctant to change. It sure seems that way. Speaking of tropics – wow, it is hot where you are at!